Many companies offer 401K matching up to some percentage of your salary to encourage saving for retirement. These are free money and you should definitely take advantage of it. However, to maximize it, you need to read your company policy carefully. Some company offer feature like “true-up”, basically you set you contribution percentage, they will match up to a percentage (say 5%). If the total contribution in the middle of the year exceeds the $18000 limit, they will still give you 5% as if you contribute evenly over the year. If your company offer such policy, congratulations, you don’t need to worry anything. Just set to the maximum percentage allowed. It will get your account funded early in the year and let the compound work for you. My company used to have that feature. But they changed the policy this year. Now they require me to contribute to the pay period to get the company matching. So if I funded the account too quickly (reaching the $18000 limit before year end), I will miss out some free money. If you are in similar situation, then this post might be helpful to you. I have created a calculator using Matlab to figure out the best option for 401K contribution. You can plug in your own number to figure out yours. Here are the source code with some bogus numbers in there. 15% bonus payout at end of Feb and Aug. Here is the result from the program. 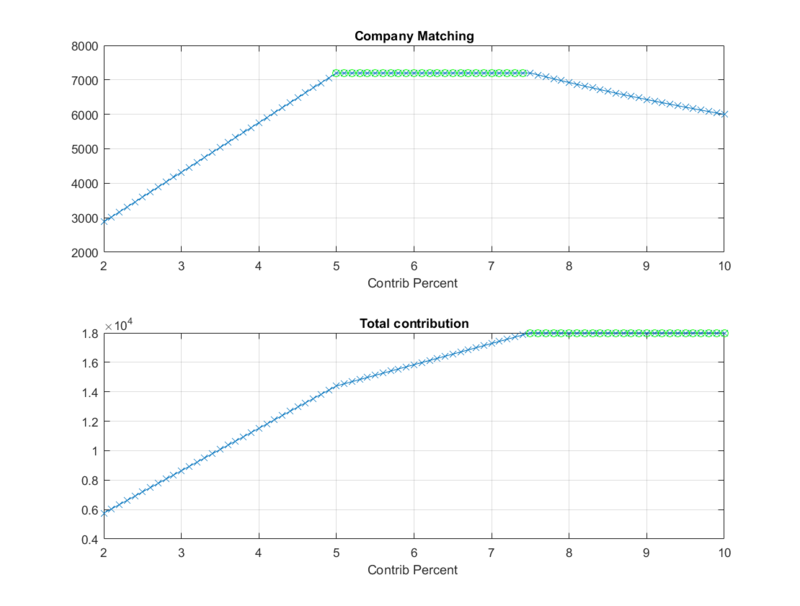 Basically to maximize company contribution you will need 5% to 7.5%, contributing more, you will actually get less matching. If you want to maximize the 401K contribution as well, then the 7.5% is the optimum option. To run this script, you will need to install Matlab or its free counterpart Octave. What is the best percentage for your 401K? Let me know if it is helpful.